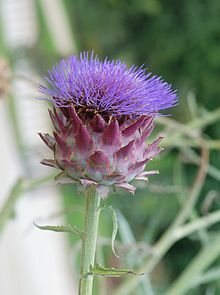 This a an evergreen perennial thistle.Globe-Artichoke-in-field. It comes from Southern Europe and the Mediterranean. The edible section is the lower portion and is known as the 'heart'. The mass of immature florets in the centre of the bud is called the 'choke'. This is a versatile plant. Can be eaten or allowed to flower. A beautiful addition to any veggie garden, perennial border or shrubbery.